Additional dates and themes are July 2 with “Bubble Party” and July 30 with “Wacky Water Fun.” Fun at First & Main will be held from 11 a.m.-1 p.m. on the First & Main Green. Families are invited to participate in a variety of free activities provided by Akron Children’s Hospital and other participating companies. 95.5 The Fish radio station will be on site with music and giveaways. Activities vary each month and include make and take crafts, giveaways, a balloon artist, snacks, face painting/glitter tattoos, games and much more! There also is a free Fun at First & Main t-shirt giveaway to the first 250 families to register. Registration will open in mid-March. “We look forward to hosting the Fun at First & Main events once again this summer and showcasing all that First & Main has to offer in downtown Hudson. We can’t think of a better way to celebrate summer than families gathering in the heart of Hudson for fun, interactive activities at First & Main,” said Regan Gettens, vice president of property management. If your organization is interested in exhibiting, spots are still available!Contact your sales consultant or publisher Brad Mitchell for more info. 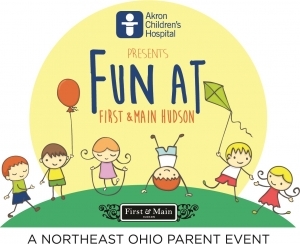 For more information on Fun at First & Main and other upcoming events, visit firstandmainhudson.com.